What Is The Best Track Workout? TOPIC: What Is The Best Track Workout? Track athletes have a different type of workout because they rely on speed, strength and power. Of course the workouts will vary with each type of competition but overall what kind of workout can be expected? How much time will they actually spend in the gym vs. the track? What is the best track workout? Why? How many workouts per week should be done for maximum benefit? The truth is there is no single best workout for track athletes in general. If all athletes wish to become the best they can possibly be they must train specifically according to their events requirements. For example the training of a 100-m sprinter will vary vastly from a long distance runner who competes in the 5,000 m or 1,0000 m. The needs of each athlete are so different. Short distance runners draw on anaerobic capacity, while long distance runners draw on their aerobic capacity. Below I separate my track workouts into 3 categories: short distance, middle distance and long distance, so workouts can be tailored more to the athletes' needs rather than making gross generalizations. Keep in mind the below workouts are designed for a track athletes 'OFF SEASON;' where the athlete's aim is to improve his/her times, which will differ from the in season; where the athlete is competing and his goal is to maintain his/her time. During this period the athlete will be required to decrease volume and intensity of his/her workout regimen, known as 'tapering' by coaches, so the athlete is fresh to perform at their best, and does not overtrain with the increased workload of the in-season. The following routines are designed for well-conditioned athletes only. Please seek medical advice before undergoing the workouts below. Click Here For A Printable Log Of Monday Weights. Jogging until a light sweat is broken. 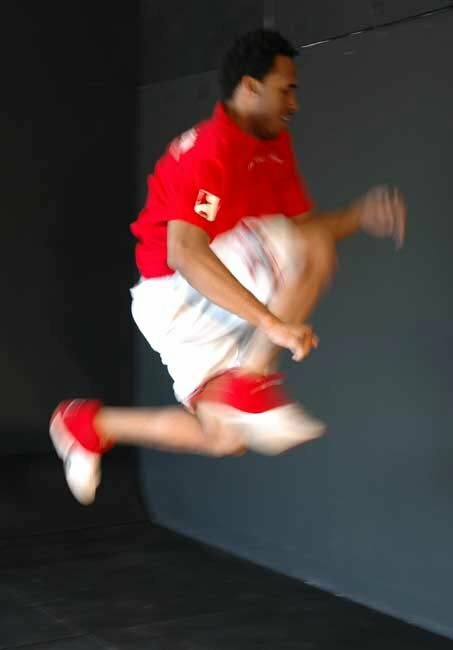 Dynamic Stretching and Short Calisthenics. 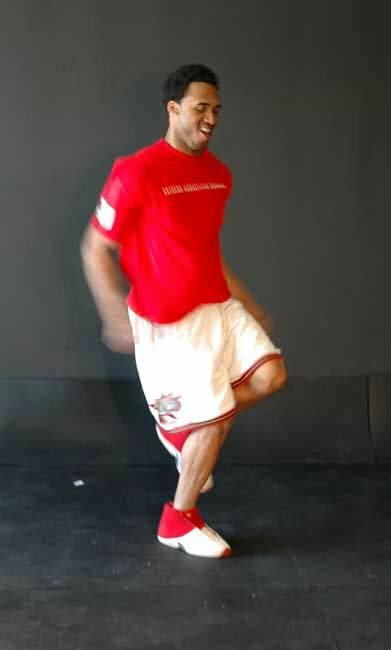 Technique Drills (Marching A's, A-Skips, Running A's, B-Skips, Running B's). Progressions (usually about 6, with the first one being a fast jog basically and the last being 95% or so). Click Here For A Printable Log Of Plyometrics Week 1-2. Click Here For A Printable Log Of Plyometrics Week 5-6. Click Here For A Printable Log Of Plyometrics Week 7-8. 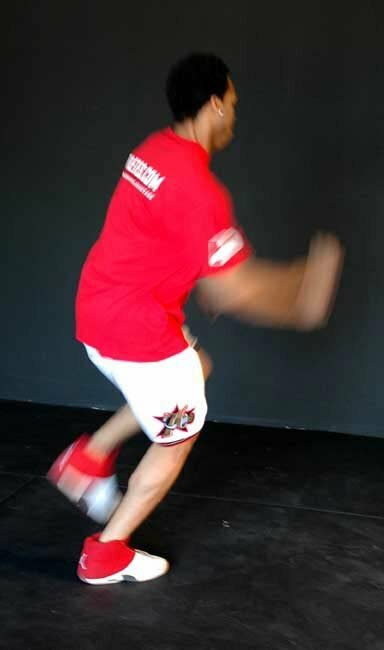 Click Here For A Printable Log Of Plyometrics Week 11-12. * Note: For sprinting work please ensure minimum 1 minute worth of recovery for every 10m run. Click Here For A Printable Log Of 100m Sprint Routine. Click Here For A Printable Log Of 200m Sprint Routine. Click Here For A Printable Log Of 400m Sprint Routine. Perform for 10-15 minutes in circuit fashion. 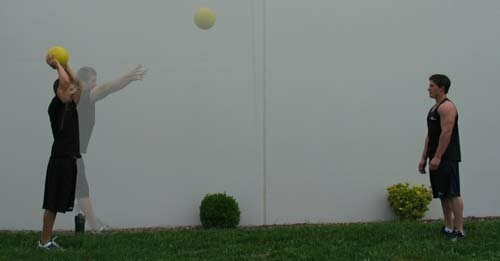 Click Here For A Printable Log Of Tuesday: Medicine Ball Throwing. 2 x 10 x 100m @ 75% max HR with a 30-second recovery between reps and 2 minutes between sets. 2 x 8 x 200m @ 72% max HR with 1 minute recovery between reps and 2 minutes between sets. 8 x 400m @ 75% max HR with 2 minutes recovery between reps. If it is not possible to maintain tempo, then a recovery of 3-4 minutes, can be taken half way through. Click Here For A Printable Log Of Wednesday Weights. GPP: (Sled Dragging): Power Striding NOT Running/Sprinting. Weights: Upper Repetition + Lower Body Speed Day. Click Here For A Printable Log Of Friday Weights 2. Static Stretching: 15-20 Seconds Per Limb. Click Here For A Printable Log Of Saturday Stretching. No running on this day, however going for a light walk is optional. Static or PNF Stretching is recommended as are other recovery techniques such as Epsom salt baths, alternating showers, full body massages. These are just a few of your options for recovery. Monday: Weights (Upper) + Speed Development. Tuesday: GPP (bodyweight circuit) + Tempo Runs. Thursday: GPP (sled dragging) + Tempo Runs. Friday: Weights (Lower) + Plyos + Speed Development. 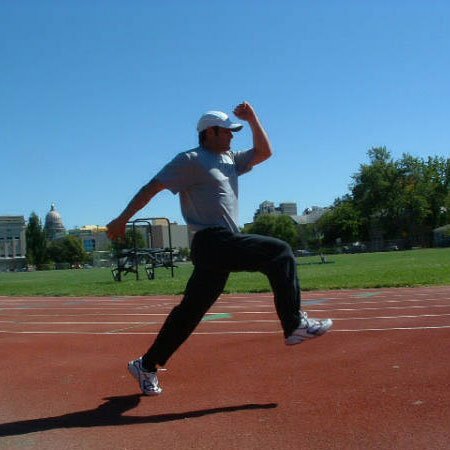 See plyos under short distance section and complete the sprints recommended for a 400m runner. Click Here For A Printable Log Of Tuesday: Bodyweight Circuit. 2 x 10 x 100m @ 75% max HR with 30 second recovery (jogging) between reps and 2 minutes between sets. 2 x 8 x 200m @ 72% max HR with 1 minute recovery (jogging) between reps and 2 minutes between sets. 8 x 400m @ 75% max HR with 2 minutes recovery (jogging) between reps. If it is not possible to maintain tempo, then a recovery of 3-4 minutes, can be taken half way through. Run 8 x 200 meters at your current 800-meter race pace, with just 10 meters of jog recovery between intervals. 2 x (3 x 200) at your best-possible 400-meter speed. 400-meter speed is about eight seconds per 400 (and four seconds per 200) faster than 1-mile race speed. Take 2-minute rests between the 200s within the set and a 5-minute recovery between sets. Just run 8-10 x 400 meters at your goal 1-mile pace, which should be no more than four seconds per 400 faster than your current one-mile race speed. Start with three-minute recoveries, and try to pare down recovery duration over time. GPP (Sled Dragging): Power Striding NOT Running/Sprinting. Once you can go for 15 minutes with that weight increase it by 10-20 lbs. Abdominal Circuit Training - pick 4-6 non weighted abdominal and oblique exercises and perform them in circuit fashion. Click Here For A Printable Log Of Friday Weights. No running on this day, however going for a light walk is optional. Static or PNF Stretching is recommended as are other recovery techniques such as Epsom salt baths, alternating showers, full body massages and any other recovery techniques. Easy run (75% race pace) for 4 minutes (800m), 6 minutes (1500m), 8 minutes (3000m). 6 x 2 x 400m @ 65-70% max HR with 30 second recovery (jogging) between reps and 2 minutes between sets. 6 x 2 x 800m @ 65-70% max HR with 30 second recovery (slow jogging) between reps and 2 minutes between sets. Mountain Climber (Shown With Swiss Ball). Interval Running: Herb Elliot I. To carry it out, run 3 x 800 at 5-K pace, with 2-minute recoveries, scoot 2 x 800 at 10-K pace, with 2-minute recoveries, and then ramble 3200 meters at 10-K velocity without stopping. 8-10 intervals of 1:00 faster jog /1:00 easy jog OR 6-8 intervals of 2:00 faster jog/1:00 easy jog. 18-20 intervals of 1:00 faster jog/1:00 easy jog OR 12-14 intervals of 2:00 faster jog/1:00 easy jog. Once you can go for 20 minutes with that weight increase it by 10-20 lbs. Week 1-2, Week 3-4, Week 5-6, Week 6-7, Week 7-8, Week 9-10, Week 11-12. "Running 5 x 3 minutes at your velocity at VO2max (i.e., VO2max), with three-minute recoveries." Workouts will vary in length for different types of athletes. Shorter distance runners in general will complete shorter workouts at a higher intensity, then longer distance runners who will in general complete longer workouts at lower intensities. No set time can be given for workouts, unless workouts have been allocated specific times to be completed within (as stated in the plans). Generally the athlete should train 5-7 days per week in the off season. If an athlete is training everyday, some light/low volume and intensity days should be included for recovery purposes (i.e. so the athlete does not overtrain). In the athletes' in-season, workload should be decreased as the athlete needs to be fresh to perform at his best, so tapering of the program must occur. 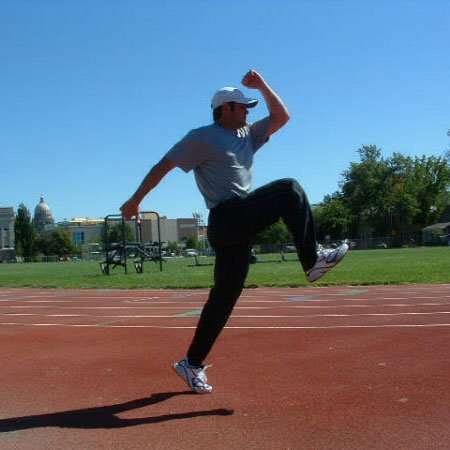 The type of training track runners must go through is different than what a weightlifter would. While typical weight lifting simply focuses of being able to lift as much as possible, runners' goals are different. What matters for them is being able to move as fast as possible and maintain their speed the best they can. To accomplish this, runners need a different type of muscular capacity: one of quick, powerful movements and of much greater endurance. Even more variation comes into play when one considers the different events a runner may compete in; a 100m sprinter [or hurdler] has much different needs than a 5k runner. When the objective is to improve running performance, obviously the majority of your training should be running. Just as with any other sport, the training for the sport takes much higher priority than hitting the weights (though it's still optimal to do so, and sports like football will focus on that anyway). A significant difference is that while many sports contain condition in practice, here conditioning is the sport. The first thing any runner needs to do is to keep loose. Pulling muscles is most common among runners (as well as shin splints and Osgood-Schlatters - it isn't as easy as it seems), so it is important to stretch out the groin, quads, hamstrings, calves and lower back well before and after exercise and also any day you don't train. Refers to partial avulsion of the tibia tuberosity, with no involvement of the tibial physis. Usually occurs in patients in late childhood or early adolescence. More common in boys, it may represent an overuse disease. The repetitive stress on tuberosity may cause partial avulsion. If intervening gap fills with fibrous tissue rather than bone, a painful non union will develop. Secondary defective ossification will cause prominence of the tubercle too. The other thing they should be doing is plyometric drilling and focusing on running form (which also differs slightly between sprinters and long-distance runners) to keep the running as efficient a possible. A big difference between track training and bodybuilding is that the training can remain much more steady, using a much more constant training routine. There will be some differences in the running workout for training the different energy systems in slightly different ways, but for the most part, you wouldn't need to hit your heart muscle from every angle or shock your lungs into growth. If one simply ran a mile every other day, and honestly tried their hardest, they could continue to improve on that (yes, eventually more distance would be much more effective, but the point stands). As I said before, weightlifting will be far from the main focus of your track training, but many benefits can be obtained from lifting, and after all, that is the point of this article. For runners, weightlifting should be frequent enough to establish a quick recovery, but it shouldn't interfere with track practice. For this reason, I recommend a 3-day full-body workout (yeah, I push the high frequency a lot, but here it makes even more sense). The workout will focus on power and endurance. Like it's been mentioned, sprinters and long-distance runners have much different needs, so there are two different workouts for each. 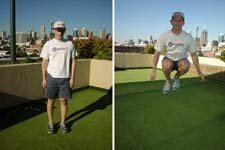 It is important to note that though runners tend to focus primarily on the quads, as the quads develop, so must the hamstrings or they run a much greater risk of being pulled. On top of that, having good posterior chain and core strength is beneficial anyway. These should be done with a weight around 60-65% of your max and performed with the concentric as fast as possible and a 1-2 minute rest between sets. With the exception of the abdominal exercises, perform the workout as 5 circuits. Click Here For A Printable Log Of Day 1: Power. Yes, sprinters need endurance too. Besides, this is still more to increase quick power, just with a little more lactic acid resistance being built in. The weight here should be closer to 50% of your max and performed as quickly as possible with 30-45 seconds rests between sets. Click Here For A Printable Log Of Day 2: Speed-Endurance. Unlike long-distance runners, lower body strength is essential to sprinters to produce the force needed to speed up so quickly. Here lifts are controlled and there is a 2-minute rest between sets. Click Here For A Printable Log Of Day 3: Strength. If you somehow get to the point where your lifts (mainly squat) near double your bodyweight without gaining excessive muscle bulk, stop increasing the weight and instead add sets, decreased rest time or more reps (unless you have other reasons to continue increasing the weight). These will be less specialized than a sprinter's workout and are mostly speed-endurance. Days 1 and 3 are done as a circuit (minus abdominal work) with a 2-minute rest between circuits. All lifts should be done in a quick, controlled manner. Have about a 30-second rest between sets and with a weight that provides good resistance, but is still manageable to do with speed. If your squat reaches the point where you lift 1.5 times your bodyweight, stop increasing the weight and instead increase reps, sets or decrease between-set rests. This lifting routine should give you good results improve your running ability. If you become too sore or fatigued to practice running effectively, reduce the volume or weight. Most likely, you'll have track practice daily and your coach will have a routine set up for you. But in case you lack a coach's help or don't like their methods in the off season, here's an example of a 4-day routine. Make sure to warm-up, properly stretch and cool down with each running session. Click Here For A Printable Log Of Day 1: Sprinting. Click Here For A Printable Log Of Day 2: Sprinting. Click Here For A Printable Log Of Day 3: Sprinting. Click Here For A Printable Log Of Day 4: Sprinting. This is a decent template for a running routine, should you be without one. You'll probably need to adjust it to suit your personal needs and increase it as you progress, but this will give you a good outline. This workout routine is specifically designed to target the needs of a runner. Focusing on speed, power and endurance, a runner can greatly improve his/her running time on top of what is gained from regular running practice. The lifting workouts should stay under an hour. They are mostly supplementary to your running practice and shouldn't use up the bulk of your energy. Track running can last longer. It is the focus of your training. The example provided is more basic level, and with progression, running workouts will be longer, also including more required rest periods. Keep training hard, run through the exhaustion and you will be able to reach the success you want.